...that The Speaker is a Warlock? "He talks. How is that possible?" "Maybe Taniks was more machine than we thought. He's not alive: perhaps he never was." Taniks Perfected is the remastered variant of Taniks, the Scarred. He was resurrected by the Devil Splicers and both his mind and body have been overtaken by SIVA. After so many losses against the new Iron Lords, the Devil Splicers sought new allies to set the odds in their favour and so turned to Taniks' crew, still reeling from the loss of their leader. Using SIVA, the Devil Splicers successfully resurrected Taniks as "Taniks Perfected", solidifying an alliance between the Splicers and Taniks' crew. After picking up chatter from the Splicers, Variks informed the Vanguard of Taniks' return. Gathering the Guardians who fought with Saladin, the Vanguard sent them to the moon to chase after Taniks in the same manner as before. Fighting through Splicers and a Fallen Walker, the Guardians cornered Taniks in the command bridge. Despite his enhanced SIVA abilities and his varied weapons, the Guardians once again slew Taniks. 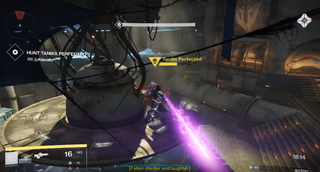 Taniks Perfected is the final boss of the Revisited version of The Shadow Thief Strike. He will already be waiting near the rift to his Ketch fending off Hive reinforcements with his cannon. Damaging him will force him to enter the rift. Once onboard his Ketch, he will pound Guardians from afar with his cannon while teleporting around the arena to throw the player's aim off. Once he sustains enough damage, he will teleport away from the arena and summon a Perfected Walker in the next room. After defeating the Walker, Taniks will reappear and lock down the hallway with his cannon to prevent Guardians from passing through. Damaging him will force him to teleport into the final room. Guardians cannot go back through the door where they came from; they are confined to this room. This is where he gains his special mechanic: a SIVA Node-powered immunity shield. Destroying all the SIVA Nodes will remove this shield, allowing Guardians to continue shooting him. This repeats until he is killed. The element of Taniks' cannon will change every time he is fought. First Solar, then Arc, and finally Void. In the kill feed, Taniks Perfected is mentioned to be with the House of Wolves although he is actually with the Devil Splicers. Unlike Sepiks Perfected, Taniks Perfected doesn't have a Grimoire card of his own. Strangely, Taniks once perfected has no color and unlike Sepiks Perfected, has no SIVA parts, only a SIVA swarm flying around him.